"I was one USB 2.0 header short and modDIY was the only place I found exactly what I was looking for. It took about two weeks from the day I ordered it to get from Hong Kong to Alaska. Be patient, it'll be worth it. A word to the wise: The splitter comes with all 10 pins intact so as to be compatible with USB, HD Audio, etc all in one package. 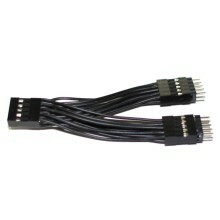 Because of this, you'll need to remove one of the pins from each of the split ends to plug in your 9pin USB 2.0 cord. It is super easy to figure out which one by following the wires. You'll have no trouble there. All you need is a pair of needle nose pliers or something similar. Additionally it should be noted I plugged in my Corsair Link CPU water cooler and a USB 2.0 port cable to this splitter and both function at the same time while in use without issue. Not sure what the issue was with the previous reviewer's bluetooth experience." "First of all, I would say the shipping is faster than I expected. I read some threads and I was worry about that my package could take a month or even longer before I can get it. I got my items from my first purchase in two weeks, I think it's quite reasonable for an international flat rate shipping. Long story short, I have a MSI Z97 Gaming 7 mobo which has two internal USB2.0 port, one is occupied by the front USB panel, however, after I installing a multicard reader and a WiFi+Bluetooth express card, I was one USB2.0 port short. I had to deactivate the Bluetooth because I need use the multicard reader. However, when I decided to use a Bluetooth gaming controller I found I couldn't live without my Bluetooth. I checked through all the online store, and only MODDIY provided this option that fitted my need. There might be some trade-off when using the splitter because I found I couldn't use Bluetooth and Multicard reader working simultaneously. However, it's no big deal, because it really rare that I will use them at the same time. At least I don't need to physically modify connection inside the computer case. The physical design is perfect for the in-case cable organizing. 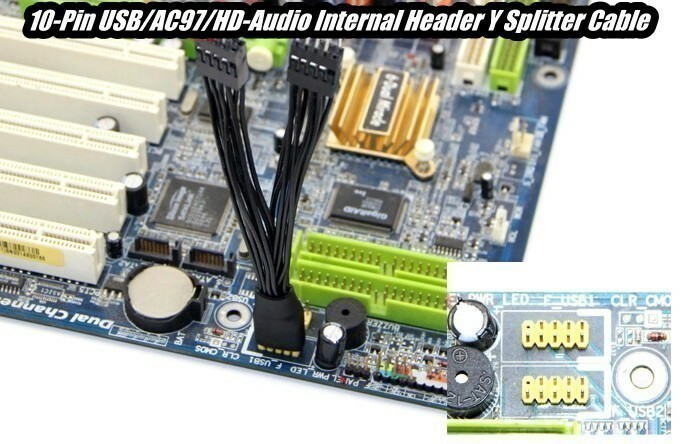 It doesn't have a lousy look when you add this small cable on your mobo. " Click the button below to add the 10 Pin USB AC97 HD Audio Internal Header Y Splitter Cable 5cm to your wish list.